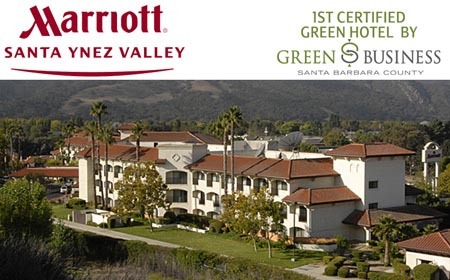 Santa Ynez Valley Marriott Hotel staff embraced the Green Business Program of Santa Barbara County and looked at all aspects of the property’s operation for ways to improve efficiency and minimize impacts to the environment. Measures undertaken include energy efficiency, water conservation, introduction of bulk soap and shampoo dispensers in guest rooms to reduce plastic bottle waste; as well as upgrading lighting throughout the hotel and installing controls on vending and ice machines to reduce energy use. Landscaping around the property is monitored closely for water efficiency and new native and water wise plants added. Recycling programs are in place throughout the hotel, including kitchens. Employees are encouraged to rideshare and runs a monthly raffle for participating staff.